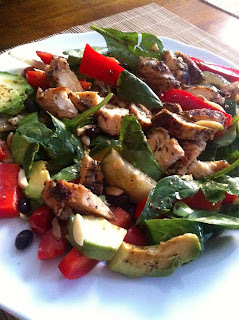 Get excited: I'm sharing a healthy, delicious power salad with you today that was inspired by the "Mediterranean diet." Did you hear about the Mediterranean diet study* published in the New England Journal of Medicine in February? I actually first heard about it on the Today Show, which is NOT where I usually first hear about scientific findings. As a researcher, I appreciate it when well-conducted research study results make popular news -- often, people in the "real world" don't know about, care about, or understand research, so interesting and useful findings ending up in the media is pretty rare. But that's the goal of our research, at least in health care, right?! Well, not necessarily ending up on the Today Show, but somehow, some way, influencing and benefiting the population at large. Sometimes it's wishful thinking, but I'm pretty sure all researchers hope for this at some level. Anyway, this particular study likely reached a larger audience because, 1) it involves a behavioral change that any "normal" person could make to improve their health, and 2) the results are pretty compelling. Basically, the authors conducted a randomized clinical trial and assigned people who were at risk for heart disease to either a Mediterranean diet or a control condition (a low-fat diet). They then followed these people for over 4 years and tracked any cardiovascular events (myocardial infarction, stroke, death from cardiovascular causes). They actually planned to collect data for longer than 4 years, but because the results were clearly indicating strong health benefits for the Mediterranean diet condition, it would have been unethical to continue the study without informing the control group. 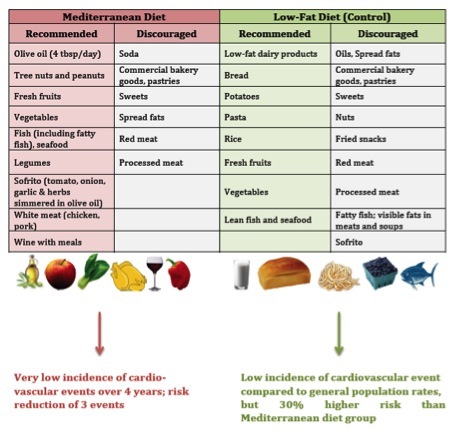 In the end, cardiovascular events were quite low for both groups (< 5%), and those in the Mediterranean diet group had a 30% reduced risk of a cardiovascular event compared to the control condition. Now, the study wasn't perfect, and additional control groups would have been ideal, but in general these are pretty cool findings. Change what you eat and reduce your risk of having a heart attack! 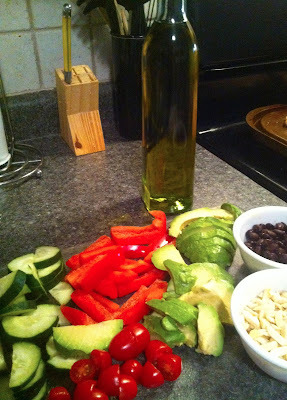 So, what did the Mediterranean diet entail, as compared to the control group? As you can see, those assigned to the Mediterranean diet were instructed to have plenty of olive oil, veggies, fresh fruits, lean meats and seafood, nuts, and beans. Oh, and wine with dinner! I knew that habit had some scientific support behind it ;) Sounds like a pretty healthy, balanced meal plan, right? They were not instructed to avoid breads, but they were aso not encouraged to eat it like the control group was. Grains were certainly not an emphasis. And they were told to avoid red meat (*womp womp*). All in all, I am totally on board with this "diet," although I like to enjoy red meat 1-2 times per week, and I would add in some natural whole grains as well. What do you think? Do you want to eat like you live on the Mediterranean now? I sure do! This nutritious, filling meal really highlights the recommended foods in the Mediterranean diet. Plenty of veggies, lean meat, healthy fats (avocado, olive oil, nuts), and beans. Mmm. For the chicken, I made my spiced chicken recipe with just oregano, dried basil, garlic powder, salt, and pepper. The flavor was great and very Mediterranean-like :) I served it warm on top of the salad. 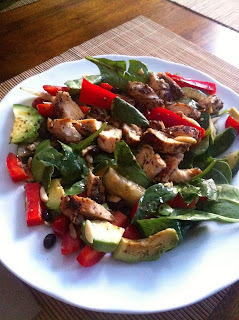 For veggies, I included spinach, red pepper, cucumber, red onion, and tomato. 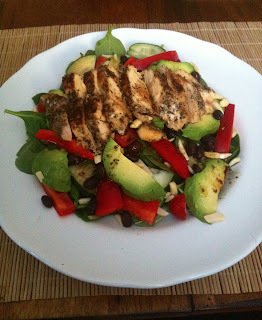 I also added some plain natural black beans, some sliced avocado, and sliced almonds. Mix it all together! 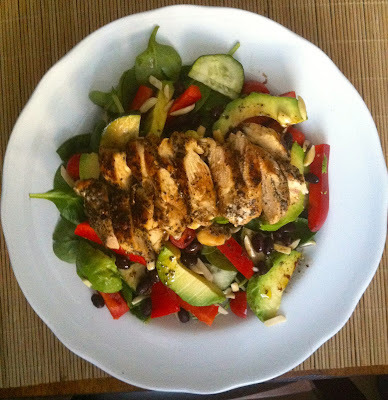 The dressing is a simple homemade balsamic vinaigrette made with olive oil, balsamic vinegar, lemon juice, oregano, and basil. 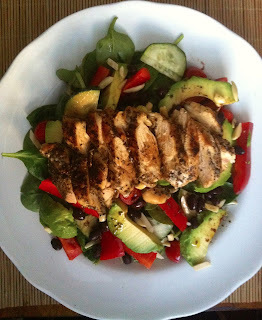 Pretty sure if I ate this salad several times a week I'd be wonder woman. 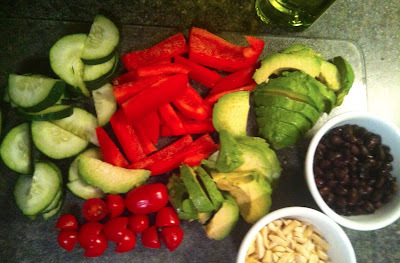 -Slice/prepare all veggies. Layer on a plate. Top with almonds and black beans. -For dressing: whisk together all ingredients. -Top salad with sliced, warm spiced chicken and desired amount of dressing. Ramón Estruch, Emilio Ros, Jordi Salas-Salvadó, et al. 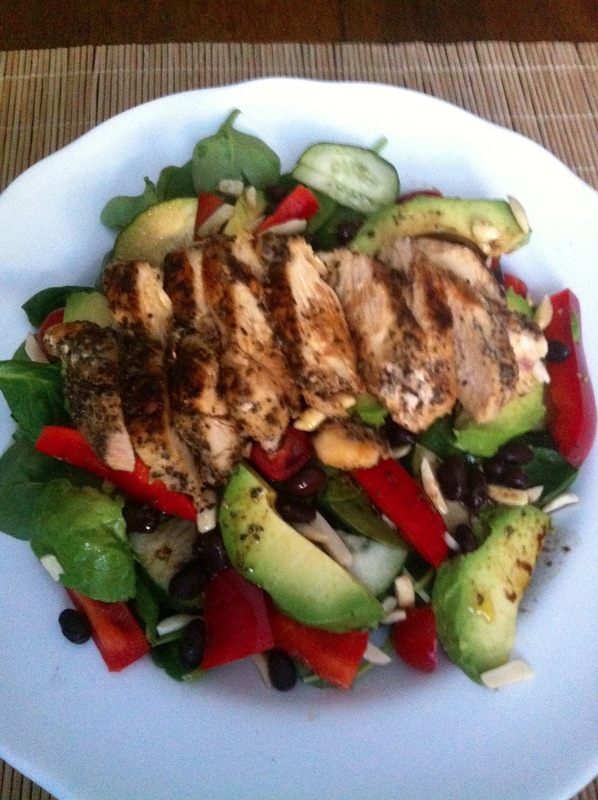 Avocados make everything better! Lovely salad.